Little Ironman’s attempt at a double selfie. On our way to school this morning, the boys and I planned our evening around Skipper’s schedule. Since Hubs is away and Skipper was volunteering after school, there was no one around to watch Little Ironman until after dinner. This meant another night run, as in a dark run, and cooler temperatures – not what I wanted at all. While at work, I felt myself becoming a bit frustrated whenever I thought of running later in the evening; I really wanted to get out right after school. At lunch, I realized that I might be able to get a ride home at the end of the day rather than walk, which would get me home half an hour earlier, and the time I needed to run in the warm sunshine. Thanks to the help of a co-worker, this idea became reality. I got home, changed and ran a lovely 12K, finishing at Little Ironman’s babysitter’s house. LI handed me his backpack, grabbed his skateboard, and we headed home together. I like to think of myself as independent; I have a hard time asking for help. But I’m slowly learning that it is alright to turn to others when I need to. 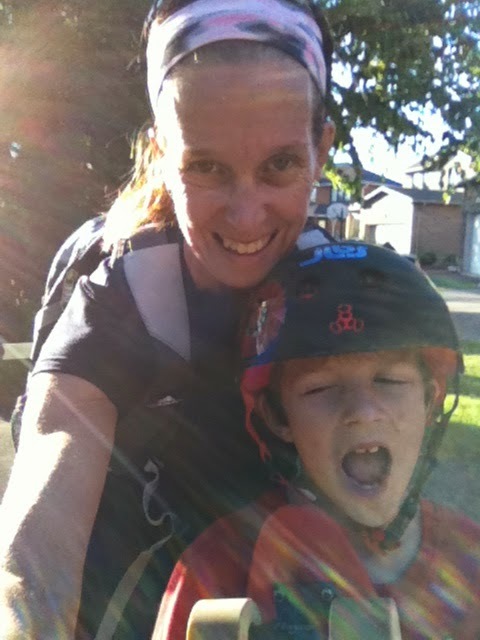 While it’s usually fine for me to run in the evening, it isn’t always okay for the boys. Tonight, getting in at 6:00, with nothing to worry about for the rest of the night, meant that I could spend time with LI. We ate dinner, baked cookies and curled up to watch the first episode of Marvel: Agents of Shield (which was great, by the way). By bedtime, he was content; LI had his much needed Mommy-time. He was so excited about our walk together that he captured the moment on camera. Today, everything somehow managed to fall into place. A happy mommy makes for happy kids, and a happy son makes for a happy mom. Next Next post: Thank you, Mother Nature.